My front porch. 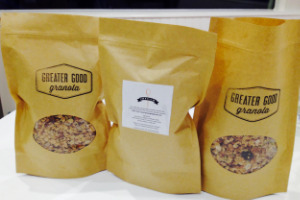 Greater Good Granola is starting what might be the first ever CSG program: Community Supported Granola. We’d love for you to join the growing number of subscribers who leave their empty mason jars (we provide for a small deposit) on my porch and exchange them for fresh-filled ones. Monthly subscriptions will begin at minimum amount of 2 lbs per month. I dare you to keep around 2 lbs of this granola for a whole month! I will also happily sell you 1 lb "one-offs" if you request them. We have a lot of one off buyers who just shoot me an order and I bring it to them or stuff it in my kids soccer backpacks to deliver. We also have plenty of buyers outside of Seattle who order their granola to be shipped. We are baking granola all of the time and we ship "priority mail"-so your granola can arrive to you fresh and soon after you place your order. Granola also makes a great gift- why not purchase a porch subscription for a friend or ship it to them as a unique surprise? School teacher gift? Carpool partner? Boss? Host? This truly is the gift that keeps on giving. Our one pound pouches are resealable and make a great gift. Contact us via email to sign up for the program or to just make a one time purchase.